Kids absolutely love the Lab in NYC. Since kids are very active and involved players we usually recommend 2+ hours of unlimited gaming for youth events. Here is how private kids events work at our VR gaming center: We start with a quick tour around the Lab. We tell kids about our full motion simulators and answer any questions about VR and VR gaming they may have. After thoroughly reviewing safety instructions and doing group training, we jump right into the VR sessions! During the first hour we focus on shorter, pre-selected single player experiences. This way we make sure that every player tries all the VR systems the Lab has to offer: VR Racing simulators, VR Flight simulator, VR Treadmills, and Wireless VR with Backpack PCs. For the second part of the event, we focus on longer sessions with experiences the kids liked the most. Our VR simulation systems are interconnected. 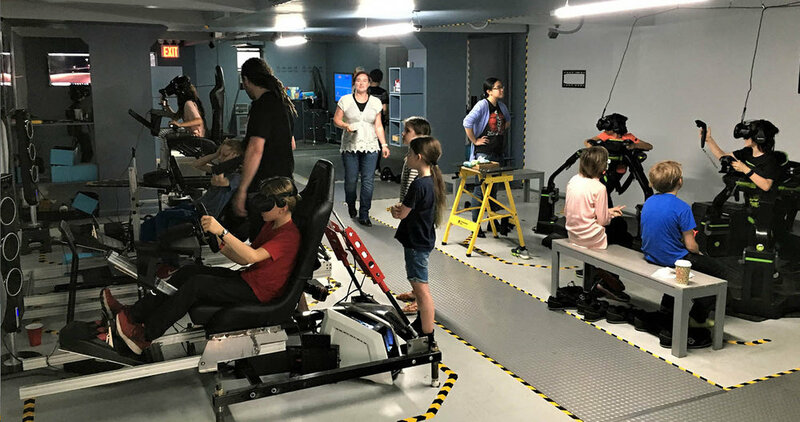 This means kids can race each other driving in our full motion VR Racing Simulators, fight zombies in co-op mode while wearing Wireless VR Backpacks, or go against each other in PvP while running in our VR Treadmills. You can find the list of VR games and VR experiences available here. Participants choose which simulator/game to play as they go, and we are happy to give recommendations. We can also accommodate for specific requests from kids and their parents. For example, Hubneo VR Lab offers a large selection of non-violent VR games and educational/creative experiences such as Tilt Brush, Beat Saber, and The Lab. In addition to VR sessions indoors, we have a large private outdoor space where we usually set up a table and benches. The crowd will spread out between the outdoors and indoors, which works amazingly well during private events. You can bring a birthday cake, food, and drinks at no extra charge. If you are a parent or school representative looking to organize a kids VR event, birthday party, summer camp, etc please email contact@hubneo.com. Let us know the date and time you would like to schedule your event, how many people will be attending, the minimum and maximum age of the kids, and how many parents will be coming. We will get back to you with availability and rates as soon as we have this information (please note, events booked less than one week in advance are subject to price increase, so it’s a good idea to book well in advance). We look forward to customizing an experience to your group’s needs!